Beth, just looking at this chart, I am assuming the blue is Sanders and orange is Clinton, but it is not labeled. Thanks for this! Yes, I’ll fix that. Sorry. Why are the names of Bernie Sanders andHillary Clinton not on the chart for Dems ? If I remember correctly, Clinton did the best with the African American community. 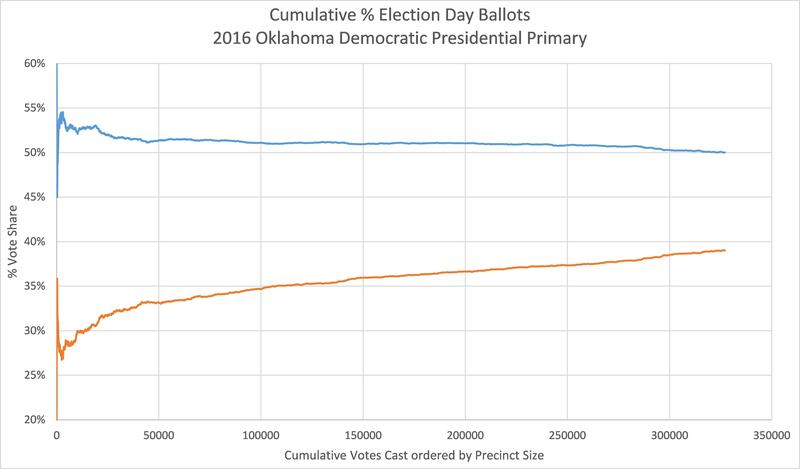 Could it be that in Oklahoma the larger precincts have a higher percentage of African Americans? . It’s possible. I haven’t looked at demographic breakdowns for OK.